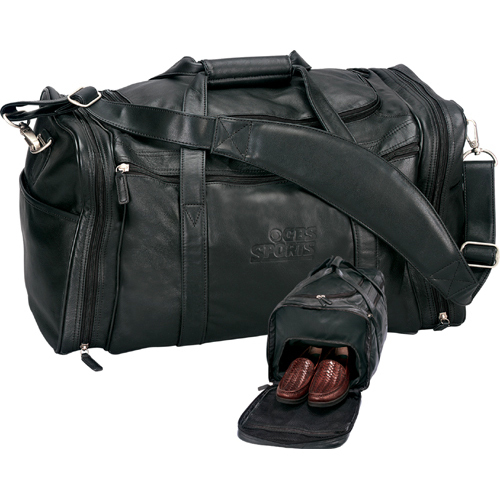 Leather Sport Duffel top grain leather bag is perfect for travel or trips to the gym. Features include a roomy main compartment with two zippered interior pockets, key hook and ID window. Two side pockets and two zippered end compartments feature a waterproof pocket for shoes or garments and mesh pockets for easy storage of Cell phone, PDA and more. Two handles, padded adjustable shoulder strap and four bottom feet ensure easy use with style. 20" x 12" x 11 1/2"